When you first start writing, whether it’s the first time or just a new writing project, the tendency is to hide your writing away, to keep it just to yourself. The conventional wisdom is that it is only a first draft, it’s probably terrible, and no one wants to see it. While this seems quite logical, it can actually be detrimental to your progress. As you write privately, you start making progress and think you are moving ahead. But then you start second guessing yourself, thinking what you’ve written is wrong, and you start the endless tailspin of revising without actually writing more. Or, you keep writing, getting yourself off topic and going off on tangents that don’t actually connect with the heart and content of your book, and what you and it really wants to say. This is why feedback during the process is crucial. Having an editor or coach lovingly review your work while you are in process or reading your work to a group of writers to get supportive yet constructive feedback, can mean the difference between moving forward and finishing your book, and just “wandering around” in your head, trying to get it done, and feeling that anguish of spinning in circles. Now if this sounds scary to you, keep in mind I am not suggesting that you show your work to just anyone, but people who either edit and do book coaching professionally, or like-minded, supportive people who have been published or are actively writing with the intention of being published. These are the kinds of people that have been where you are now and can help you navigate your way to completion and success. 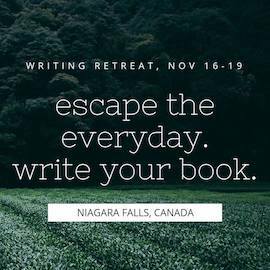 This is why I am hosting a writing retreat November 16-19 in Niagara Falls, Canada. We will be staying in a beautiful private home for the weekend, eating healthy, nourishing food prepared by an Award-Winning Holistic Doctor of Humanitarian Services, who is also a fabulous chef. And most importantly, we will be writing. You will receive feedback, editorial support, creative coaching and encouragement from me, as well as your other writing sisters focused on the same singular goal. Spending time with a group of like-minded, conscious women dedicated to honing their writing craft and sharing their message with the world, will help you to shut out the rest of the world and focus on getting a big start on your book, or working to finish your first draft and move towards publishing your book. Sharing your writing might seem like you are opening a vulnerable part of you, and it is. But if you do it safely, with caring support and with the right people, you can expand your writing and find out what is possible. If you can come to the retreat, I encourage you to take that leap and come with us for a weekend of writing, nourishment, and fulfillment. If you can’t I hope you will share your writing with someone who can help you take the steps to share your words with the rest of the world.